Last year experts predicted 60 cranes in the Puget Sound summer. 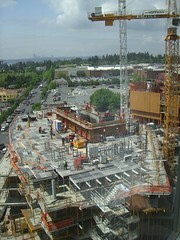 This summer there is ‘record’ downtown Bellevue city construction. Inbetween, in November, tragically, one crane fell over. Cranes have seasonal behaviours, either hibernating in the winter or going south to sunnier climes. This scribble was published on Saturday, June 2nd, 2007. You can follow any banter on this scribble with the RSS 2.0 feed. You can leave a response, or trackback from your own site.